US Chemical Storage pesticide storage buildings are uniquely designed to safely store agriculture and turf management chemicals. All chemical and pesticide storage buildings are constructed to fit your exact application. Customize your pesticide storage building to mix and dispense agrichemicals and other forms of hazardous materials. Pesticide storage buildings come in a variety of sizes, depending on storage applications and volumes used. US Chemical Storage offers a customizable design to meet your exact specifications, in order to deliver the highest quality product available. US Chemical Storage buildings offer a safe, secure and 100% compliant method for your mixing and dispensing applications. All pesticide storage buildings feature a 15-year structural warranty, an EPA compliant, leak-proof secondary containment sump, and a 2-part epoxy coating to deliver a long-lasting, quality product. These outdoor storage buildings can be customized for storing flammables and combustibles with our tested fire-rated construction. Our compliant 2-hour and 4-hour fire-rated constructions are available to store flammable chemicals safely. Learn more about our fire-rated construction. Outdoor storage building safety accessories include, but are not limited to temperature control systems, cooling systems, heating systems, mechanical ventilation, alarms, gas detectors, liquid level sensors, lighting, access ramps, and a wide variety of explosion proof accessories. Fully compliant pesticide storage lockers are designed by professional engineers and built to last. Constructed from heavy-gauge steel and continuously hand-welded for maximum strength and reliability. These buildings meet IBC, IFC, EPA, OSHA, NFPA regulations and FM or Warnock Hersey approvals. EPA compliant, leak-proof spill containment. Static grounding system, and seismic bolt down plates. Explosion proof and non-explosion proof safety accessories available. Exhaust fans – six (6) air changes per hour. Chemical, weather and UV resistant. 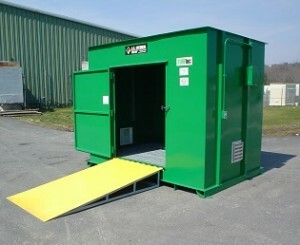 Reduces contamination, storage risks and liabilities.